Posted by Andrew Warren on Google's Official Blog. Andrew is a Product Manager and Printing Prophet at Google. Have you ever needed to print a boarding pass, whitepaper, or speech, and didn't have your computer at hand? Google Cloud Print helps you print from anywhere to anywhere using any device, and we’ve recently made several improvements on that front. First, if you have an Android smartphone or tablet, we've released the Cloud Print app in Google Play to make it easier to print documents and files on the go. 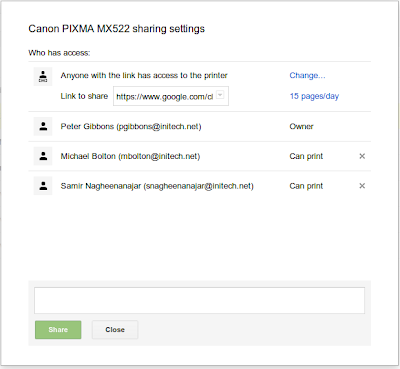 Second, if you work out of different offices or other public spaces like a school, you can now easily share a printer with anyone nearby, by simply publishing a link. In addition, we’re releasing two new tools today to make it even easier to print anywhere, anytime. The first, Google Cloud Printer, makes it possible to print to any of your cloud printers from Windows applications such as Adobe Reader. 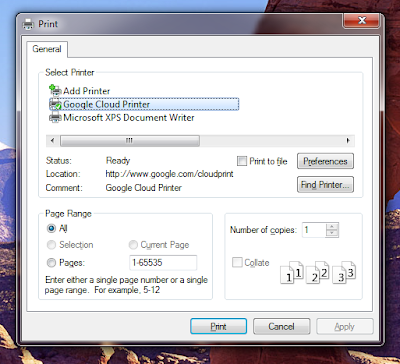 The second, Google Cloud Print Service, runs as a Windows service so administrators can easily connect existing printers to Google Cloud Print in their businesses and schools. We’ll continue evolving Google Cloud Print to make printing simple and easy from as many devices as possible. For now, the future looks good on paper.